I’m of the firm opinion that for the money, French pharmacy brands offer some of the best solutions for diffcult skin-types. Escentual.com have long been my online destination for French pharma-brands, the beauty retailer offers shoppers worldwide a range of continental treats that can be difficult to source on the high street. For the next 31-days customers can enjoy a full 1/3 off the price of Vichy, La Roche Posay and Nuxe; 25% off Avene, A-Derma, Klorane, Rene Furterer, and Pierre Fabre Dexeryl; and 10% off Caudalie. As if that isn’t exciting enough… in celebration of this, I’ve teamed up with the guys at Escentual to offer five lucky Lipglossiping.com readers the chance to win a set of my personal top French Pharmacy picks. A-Derma Epitheliale A.H Repairing Cream is a skin miracle for those of us with combination/make your mind up skin-types. It delivers comfort to my most irritated patches without saturating my t-zone. 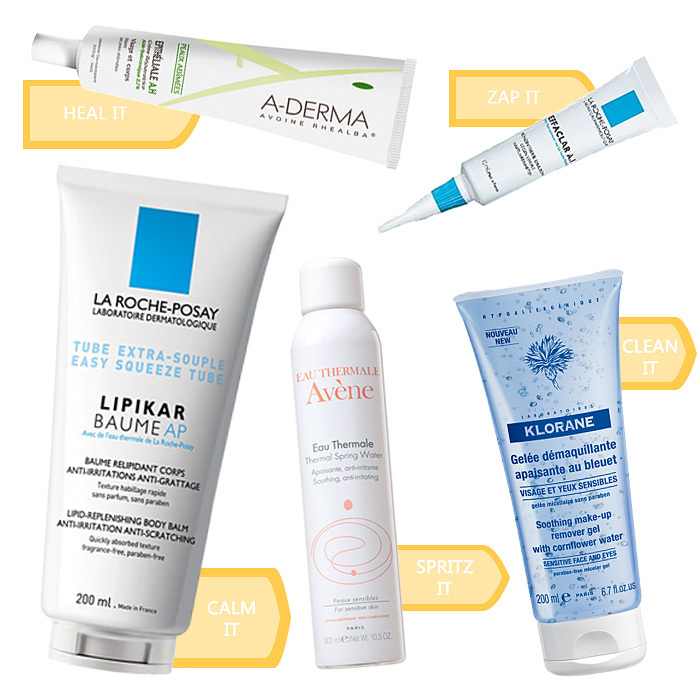 La Roche-Posay Effaclar AI is a product that I’ve written about many times before. Got a spot? Zap it with this and watch the “anger” disappear overnight. La Roche-Posay Lipikar Balm AP delivers rich moisture to dry skin. Use allover the body to calm and nourish irritated skin. Avène Thermal Spring Water Spray remains one of my Summer staples. Cooling, refreshing, and the perfect skin pick-me-up. Want to win the above products? Leave a comment telling me whether you’ve tried anything from a French pharmacy brand and if so, what’s been your favourite? 3. There are five prizes to be won, a set of five French pharmacy products as listed above. No cash alternative. 4. Lipglossiping.com is the sole promoter of this competition. 5. Only one entry per IP address will be accepted. 6. Personal details will only be used in the context of this competition to inform the winner(s) of their prize status. 7. Five winners will be selected at random from all entries received. 8. Winners will be notified within 7 working days and will be expected to reply to an email sent to the address used to enter your comment within 5 working days or risk forfeiting the prize. Barry M Instant Nail Effects - Nail Art on the CHEAP! Limited Edition products for Superdrug's 50th Birthday!